Neil Mackenzie picked up his new Nissan Qashqai 1.6, on Thursday 1st October, in Stunning Arctic White. He has been looking at the Qashqai over recent months, & has been impressed with the reports, and reviews in magazines, and on the internet, about the car. He was also pleased with the specification of the car, as it comes with Bluetooth in all models, as Neil lives in Birmingham, and always needs to be contactable, when driving. 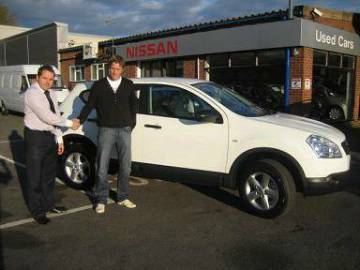 We wish Neil all the best with his new Qashqai, and all the best to a quick recovery, and back to scoring goals.